We specialise in African Art, African Curios and African Crafts. Our business is strategically situated in Nelspruit, South Africa, which is in the heart of our Country's largest tourist area and on the doorstep of the KRUGER NATIONAL PARK. Most of our African art items are sourced from this area, where rural artists create the most beautiful articles from natural sources like wood, clay, soapstone, reeds and grass. We also regularly source African art from neighboring Swaziland, the Mountain Kingdom. 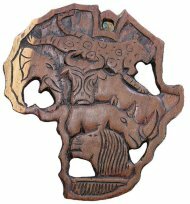 They have a huge selection of art and crafts and we also obtain African arts from Mozambique, Zimbabwe, Congo, Malawi, Kenya, Tanzania, Ivory Coast, Zaire and Botswana, which find their way into Swaziland. Should you be looking for something specific, feel free to email us - we should be able to source whatever you want. ANCIENT MASKS FROM CAMEROON, IVORY COAST AND NIGERIA!